Why did Coca-Cola object to having their advert appear on this Rush album cover? Hugh Syme got his first sleeve commission from Rush in 1975, after the group’s record label noticed a cover he’d designed for the Ian Thomas Band. That first job, on 1975’s Caress Of Steel started a friendship between Syme and the band that saw the designer inducted into the line-up as keyboard player on the following year’s 2112 album. Indeed it is Syme who plays piano on Different Strings on Permanent Waves, although his defining contribution to Rush’s breakthrough album remains the cover he devised with drummer Neil Peart. Alongside its central image of a knicker-flashing glamourpuss in the path of a tidal wave, the resulting cover was awash with reference points. ‘Peart’, ‘Lee’ and ‘Lifeson’ [nods to the drummer, frontman Geddy and guitarist Alex] are just visible on signposts in the distances. 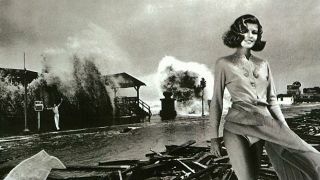 The waves, both in the model’s hair and the tsunami – were obvious visual allusions to the album title. Another bone of contention was the Chicago Daily Tribune newspaper in the foreground of the sleeve. Originally showing the infamous front page from 1948 (when the paper wrongly reported the result of the US presidential election as ‘Dewey Defeats Truman’), the threat of legal action resulted in the headline being obscured on all but the earliest pressings of the album.